Not all pool loungers are created equal, and this giant inflatable dachshund raft from Kool Pool is definitely a step above the rest. 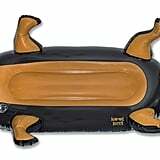 The Pool Pup Float ($60) is just about the cutest thing we've ever seen, so if you're a fan of dachshunds, dogs in general, or just high-quality pool lounging, this float is a must-buy. Measuring seven feet long from snout to tail and weighing in around seven pounds, everyone is going to be fighting to claim this extrathick 7P-Free PVC lounger at your next pool party. Best of all: it has cup holders! What more could you want from an inflatable pet? Shop it ahead, and check out even more adorable pool loungers on Amazon.